Home People North Carolina based Coast Guard Cutter Diligence enters drydock in Curtis Bay, Md. North Carolina based Coast Guard Cutter Diligence enters drydock in Curtis Bay, Md. Jul 10th, 2014 · Comments Off on North Carolina based Coast Guard Cutter Diligence enters drydock in Curtis Bay, Md. CURTIS BAY, Md. — The Wilmington, N.C.-based Cutter Diligence recently entered the Coast Guard Yard in Curtis Bay for drydock availability. For the next three months, the 50-year-old medium endurance cutter will undergo critical maintenance work to extend its service life by approximately 10 years. This work will ensure Diligence will be able to carry out Coast Guard missions for several years to come. Shortly after arriving in Curtis Bay, Diligence was lifted out of the water on the Coast Guard Yard’s new synchronized lift platform dry dock. For the next nine weeks, Coast Guard Yard crew will replace the cutter’s worn shaft bearings, repaint the hull, underwater body, superstructure, and improve the habitability of crew berthing areas. Altogether, the work will cost approximately $2 million. While critical work is being done on the Diligence, its crew will stay busy. Some will be attending training or will be detailed to other Coast Guard units. Those staying onboard will be working on areas and systems not being renewed or repaired by the Coast Guard Yard and completing a variety of other tasks to get the cutter fully prepared for her next patrol. Due to the drydock schedule, Diligence will be away from Wilmington for her 50th Anniversary on Aug. 26. However, Diligence and her crew have scheduled a celebration recognizing this milestone over the Veteran’s Day Weekend on Nov. 8-11 at Wilmington. 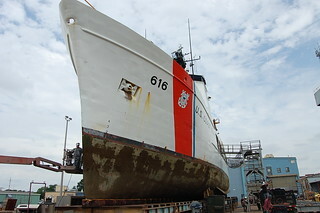 For over a century, the Coast Guard Yard has built, repaired and renovated ships for the Coast Guard. It is the service’s sole shipbuilding and major repair facility, and an essential part of the Coast Guard’s core industrial base and fleet support operations. Diligence is one of 25 major assets to be worked on at the Coast Guard Yard in the past twelve months. The Coast Guard Cutter Diligence is a 210 foot medium endurance cutter permanently homeported in Wilmington, N.C. with a crew of approximately 70. Diligence was most recently assigned to Operation Ocean Hunter to support Coast Guard missions along the eastern seaboard.